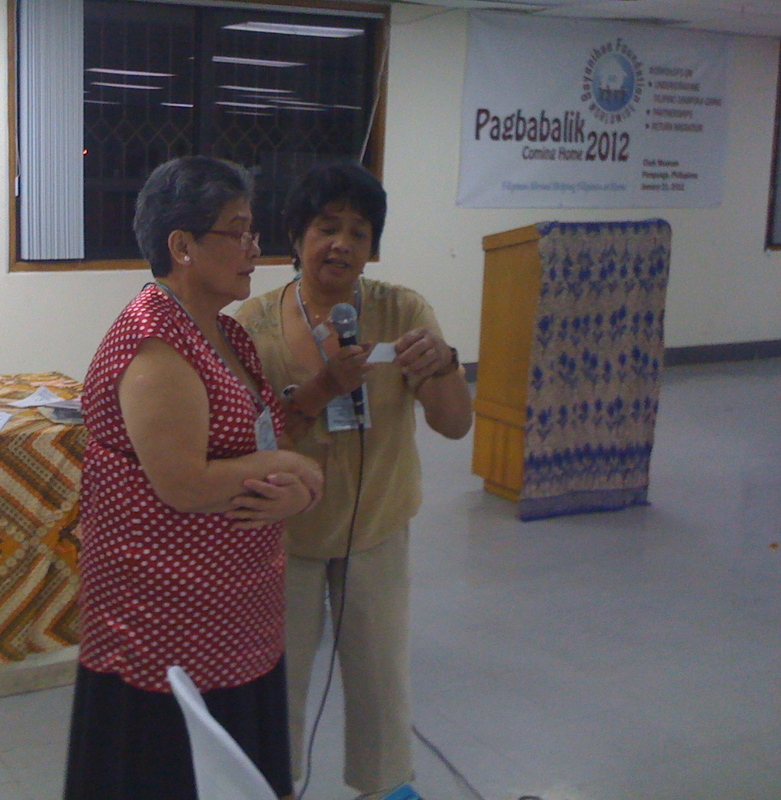 From left: Bayanihan’s long-time supporter Shirley Pintado from Chicago and Organizing Director Myrla Baldonado reading the names of the winners during the second “Pagbabalik” (Coming Home) workshop last January 2012 at the Clark Museum, Clark Special Economic Zone, Pampanga, Philippines. The Bayanihan Foundation Worldwide would like to congratulate and thank the Pagbabalik 2012 Raffle winners for winning these wonderful prizes while supporting Bayanihan’s mission and work. Thanks also to our numerous supporters from Illinois, California , Las Vegas, New York, Massachussets and Minnesotta who sold and purchased the tickets. The beneficiary of this year’s raffle draw were the United Philippine Amerasians (UPA) or “America’s forgotten children”. Proceeds went to a leadership training and consultative evaluation work. First prize winner Bennie Cayongcong from El Centro, CA ( Ticket# 277445) won an economy round trip ticket to anywhere in the continental US; Second prize winner Hannah Flores . from Torrance, CA (Ticket # 277484) won a 32″ inch TV; Third prize winner Amara Vattanakul. (Ticket #277592) won an Apple Ipod. This entry was posted in Amerasians, Bases clean up, Diaspora Donors, Diaspora Giving, Disaster Relief, Education, Environmental conservation, Health, homelessness, Immigration, justice, Labor, philanthropy, Philippine poverty, Philippines, Poverty, Remittances, Uncategorized, Volunteerism, Youth leadership development and tagged community involvement, diaspora, environmental conservation. Bookmark the permalink.